Fairborn’s Shaunn Monroe shoots over Sidney defender Ratez Roberts’ block attempt for the go-ahead score in the Skyhawks’ come-from-behind 63-61 win, Jan. 18 in the Baker Memorial Field House. Jarod Bodekor (23) puts up a shot while surrounded by a trio of Sidney defenders, in the first half of Friday’s Jan. 18 high school boys basketball game in Fairborn. Tylen Eatmon (2) puts up a 3-point shot and is fouled by Sidney’s Andre Gordon, in the second half of a Jan. 18 high school boys basketball game at Fairborn’s Baker Middle School. 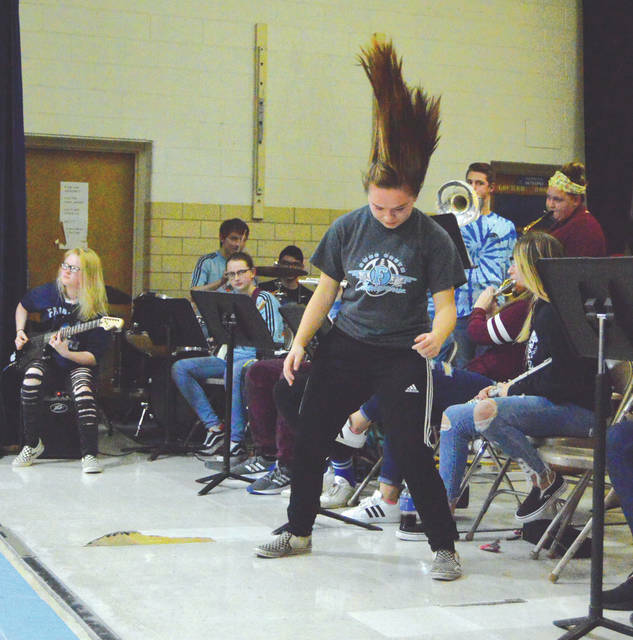 The hair flies as a Fairborn High School band member dances to the music, Jan. 18 in the Baker Memorial Field House. 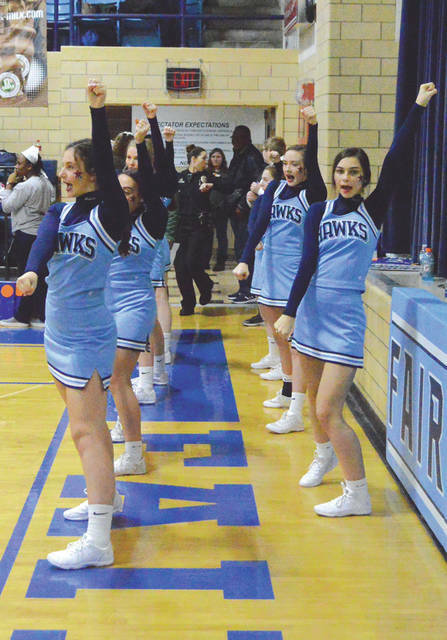 The Fairborn cheerleaders fire up the fans during the second half of Friday’s Greater Western Ohio Conference boys high school basketball game between the host Skyhawks and Sidney. 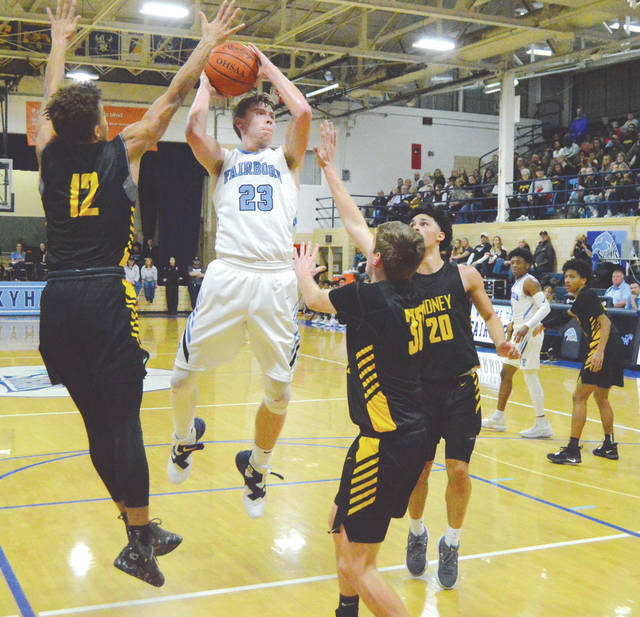 FAIRBORN — The host Fairborn Skyhawks rallied from 17 points down to claim a 63-61 win over state-ranked Sidney, Jan. 18 in the Baker Memorial Field House. When Sidney’s Keith Lee buried a 3-pointer early in the third quarter to enable the Yellow Jackets to double up Fairborn by a 34-17 score, things were looking pretty bleak for the host Skyhawks. But Fairborn pulled to within 10 points through three quarters of play. Then a Shaunn Monroe shot high off the glass from the right baseline with 4.8 seconds in the contest gave Fairborn the lead for good. Monroe was fouled on the play, missed his free throw, but Tylen Eatmon was there to snag the rebound. Eatmon quickly passed the ball to senior teammate Jared Bates, who was fouled. 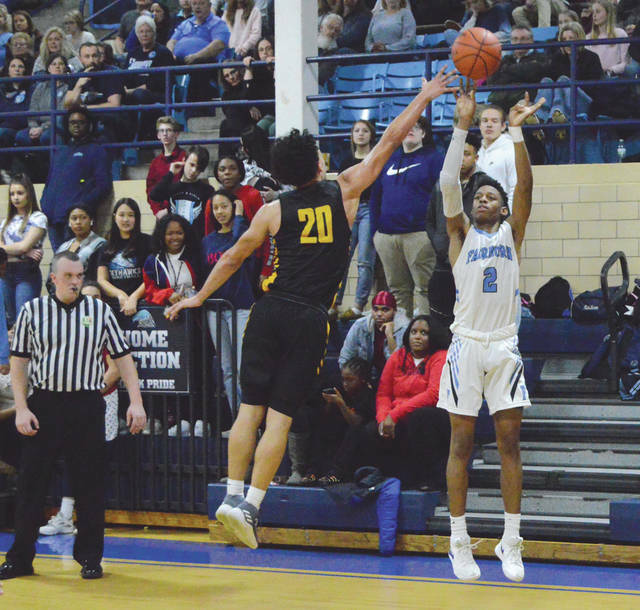 Bates hit the first of two free-throw tries for Fairborn’s final point in a wild come-from-behind win. Fairborn outscored Sidney, 18-6, in that final quarter of play. Monroe finished with a team-high 18 points, Joe Nickel scored 14 despite a strep throat, and Jarod Bodekor added 13 for Fairborn (9-4 overall, 6-1 in the Greater Western Ohio Conference’s South division). Sidney, currently ranked No. 10 in the latest Associated Press state boys high school basketball poll in Division I, is now 10-2 overall this season and 7-1 in the GWOC North. Andre Gordon tied Monroe for high scoring honors with 18 points of his own. Roberts finished with 14 for the Jackets, and the aptly named Trey Werntz hit a trio of treys to finish with nine points. 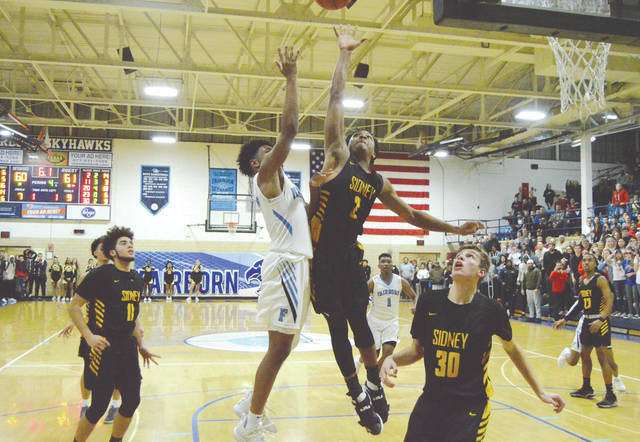 Sidney has a nonleague contest scheduled for 7:30 p.m. Saturday Jan. 19 against Lehman Catholic, they’ll then get back into GWOC action on Jan. 22 when they play at Stebbins. Fairborn returns to action on that same Tuesday, Jan. 22 when they play a 7:30 p.m. contest at Piqua. Two of the Skyhawks’ final eight games are against Trotwood-Madison, the state’s No.2-ranked team in Division II, and the division leader in the GWOC South. “We have two big games with Trotwood coming up. I think a win like this can give us more confidence. The kids have been buying into what we’re doing since day one, and if they continue to buy in, we’ll have a great season,” Harchick said.